Grown for production in the Coastal regions of California and also Yuma region of Arizona—Fennel is a cool season plant—plants that thrive when temps are 60-65 degrees or cooler and tolerate some frost. It is staple of the Mediterranean and India cuisines and Ayurveda healing. Fennel is considered a cooling herb—often after a meal in an Indian Restaurant, you will be offered a mixture of fennel seeds, anise seeds, coconut, and sesame seeds mixed with a sweet and peppermint or rose oil as a breathe freshener and digestive. It can used to help eliminate gas & bloating. It is also recommended to calm a lot of coughing. This must be why I have been craving it with all the coughing that blew in with the winter grunge. The first time I remember tasting Fennel was at my friends’ Martha and Dino’s home. Dino—son of an Italian pasta maker—loved food and loved seeing friends eat. The first time I dined at their home, the pasta was so delicious—Spaghetti ‘al denti’ with chopped fresh tomato, basil topped off by a really good imported Parmesan grated over the bowl. Dino politely got up from his chair came around the table and offered to serve more pasta. How could I resist this charming man? “Oh, yes please, Grazia!” I said. Little did I realize the pasta was only the first course—there would be a main course, followed by salad course, followed by a beautiful fruit platter—typical Mediterranean style. Over the years, I saw this trick played over and over—as unsuspecting Americans were grandly entertained—not anticipating the amazing courses yet to come! The new guest politely trying to finish each and every delicious bite; Dino sometimes encouraging a third helping! Keeping an ever watchful eye on the succession of plates as they were placed in front of the latest unsuspecting guest, Dino’s smile and twinkling eyes would give him away. We still laugh about being snared in this gluttonous ploy and how this delighted Dino to no end. RIP sweet Dino! Eating in this manner—sans the second (or third) helping of pasta— makes so much sense when you think about it —you fully enjoy one plate at a time with all the taste sensations they bring. The brain signals digestive enzymes in a calm manner for the most efficient digestion, rather than going crazy as we sample a little of this or that… pouring all the digestive enzymes in vegetable, starch, meat in every possible scenario at once! The salad after the pasta and meat course helps with the further digestion. Then market fresh fruit—beautifully sliced and displayed on a plate—what a healthy, satisfying way to get your daily allowance. Now in Italy, after all these courses it would be tradition to take a stroll! This recipe is so easy—once ingredients are out— it can be assembled in less than 5 minutes! 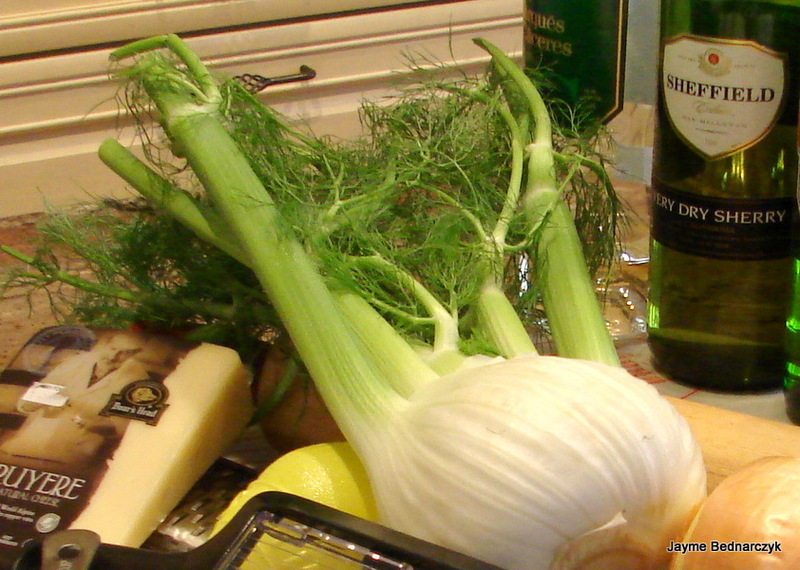 · Trim the base and remove the coarse outer layers of the fennel. Discard the tops, saving ¼ cup of the finest green leaves, chopped fine. Slice the fennel bulb horizontally into the thin slices—a Mandolin is great for this. · Add the parsley, crushed red pepper, salt and cracked pepper. Toss all the ingredients with the olive oil. 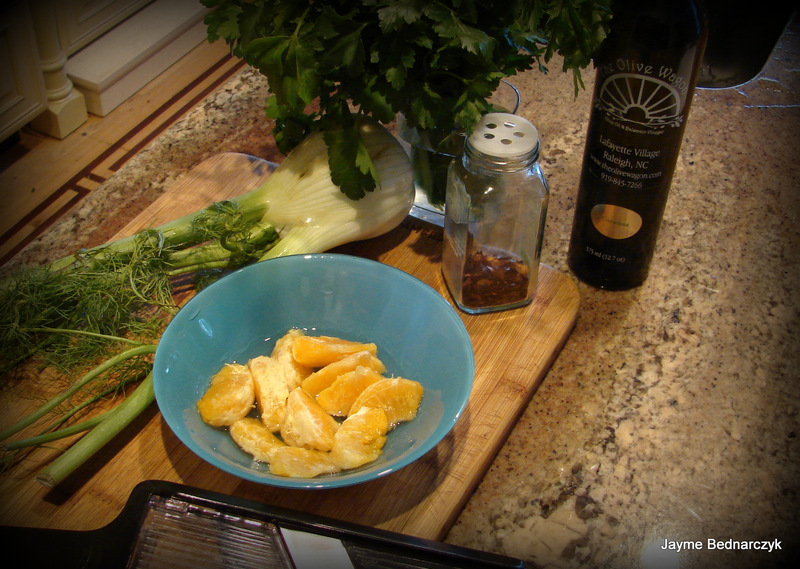 · Garnish with the chopped fennel leaves and serve. To change it up a bit, add some fresh mozzarella! With the fennel, parsley & red pepper flakes this would certainly qualify as a ménage à trois— Salad with Benefits! 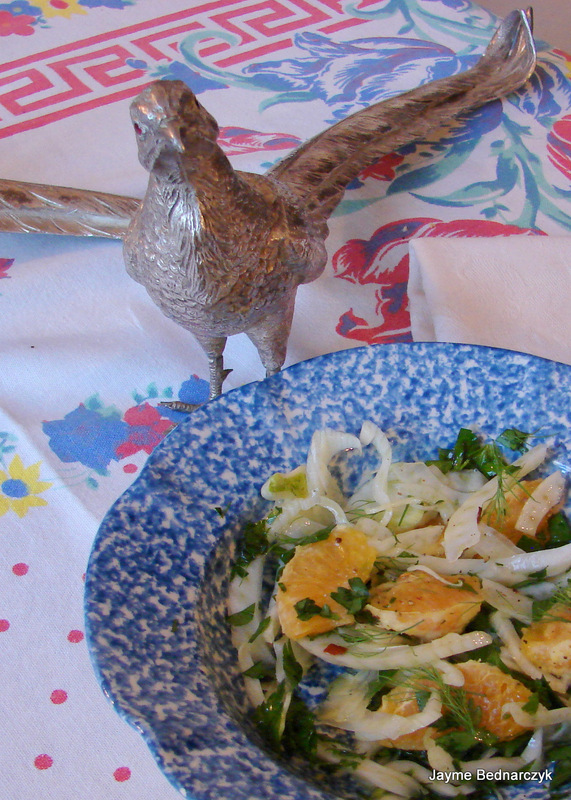 This entry was posted in Cooking, friends, Recipe and tagged Fennel, friends, Ménage à Trois, orange, parsely, Plants with Benefits, Red Pepper. Looks like a great salad! I love roasted fennel too. Fennel, fennel seeds, roasted, Carmelized raw… Especially when shared with friends! Wish you lived closer Marian! l mio caro amico, sono stato cucinante e mangiante ed ospite divertente come un italiano questo anno. Forse era gli ultimi viaggi dell’estate in Italia che ha ispirato questa nuova tendenza o forse è appena che amo cucinare e mangiare ed intrattenere. Ho incontrato soltanto Dino una coppia di volte in modo da non posso incolparlo di sebbene ci sia stato certamente un’aria “di La Dolce Vita„ nella casa di Martha e di Dino alla spiaggia di Wrightsville. Amore il vostro blog e dei vostri receipes. Grazie mille. Abbracci e baci! yard is lush. Guess what’s for dinner?! Funny.. I was working on two different versions of my Italian response and ended up sending both. Perfecto! Loved them both… And those blender drinks!